August 8, 2016 – The North American Maritime Ministry Association completed a fantastic annual conference focused on the welfare of seafarers and fishers around the world. Running from August 2-5, 2016 at the scenic Portsmouth Renaissance Waterfront Hotel in Portsmouth, VA, the conference gathered more than 100 representatives from international seafarers’ and fishers’ welfare agencies to discuss the most critical issues of their work regionally and worldwide. Social isolation is not just the subjective feeling of loneliness, but the objective state of separation from others. Besides the natural separation from others while miles out at sea, participants noted trends such as smaller crews, changes to working hours, increased paperwork, multinational crews and the effects of usage or lack of the Internet. 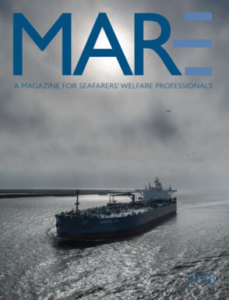 No doubt, an increasing number of scholarly studies note that the various causes of social isolation contribute both to marine incidents and the challenges to seafarer retention experienced throughout the industry as a whole. Ian Urbina, Pulitzer-prize winning New York Times journalist and author of “The Outlaw Ocean” article series. Urbina presented on the challenges to fishers’ welfare worldwide. Martin Doblmeier, founder of Journey Films and producer of the recent nationally-televised PBS documentary “Chaplains”. Since 1984, Doblmeier has produced and directed more than 30 films focused on religion, faith, and spirituality. Doblmeier presented on the current challenges and opportunities for chaplaincy work across all sectors. The conference featured many different perspectives on the issue, but the most important was that of the conference participants themselves: representing more than 75 different seafarers’ welfare agencies, they serve thousands of seafarers on a daily basis. The NAMMA conference helped provide a place for reflection and dialogue on a significant issue of our time. About NAMMA: Founded in 1932, NAMMA exists to support and encourage individuals and organizations in maritime ministry and seafarers’ welfare by providing opportunities for professional development, fellowship, and advocacy. The work of all our member individuals and organizations in ports around North America is given without regard to language, rank, country of origin, or religion.